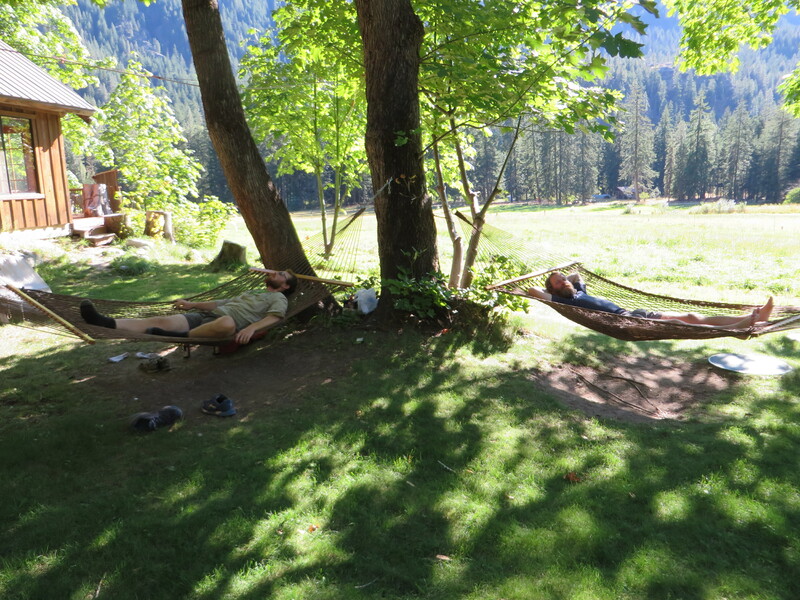 After a zero in Stehekin there is still no sign of my friends. 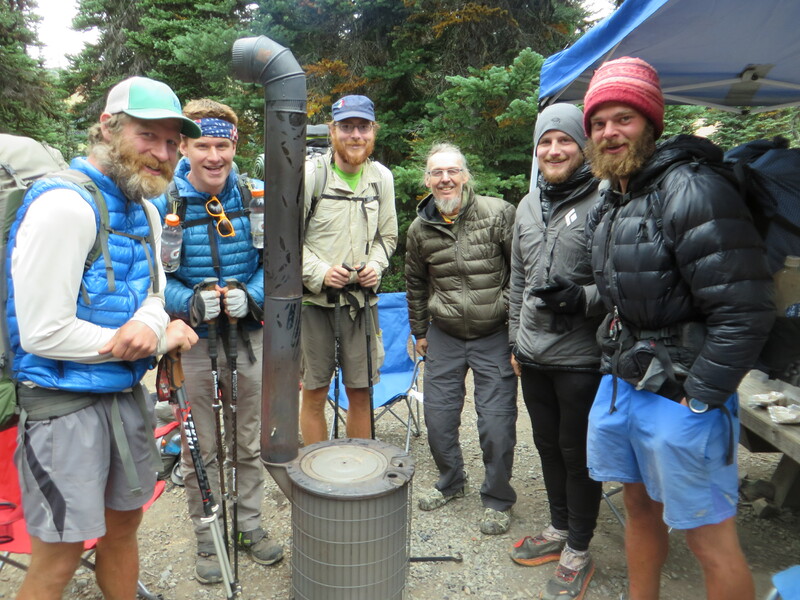 I feel the pressure, they only are 80 miles away from the border and thus at the end of their journey, I have yet another 1250 miles to go, the trail will lead me through the High Sierras, an area prone to snow fall in early Autumn. I have to keep moving. In the morning I decide to take the bus back to High Bridge, which will bring me back to the trail. The bus leaves on time. But when it is speeding up, I suddenly see all my friends, sitting at a picnic table! They are here and made it! They see me waving and they wave back at me. Soon I lose sight of them. I feel heartbroken. I didn’t even get the chance to say goodbye to them! Guys I’ve been hiking with for more than 1000 miles! My friends who become so dear to me, I suddenly realize. A day hiker who sits next to me is asking me a bunch of questions about thru hiking but I wish he would shut up, I just want to break down and cry. I hike out by myself. 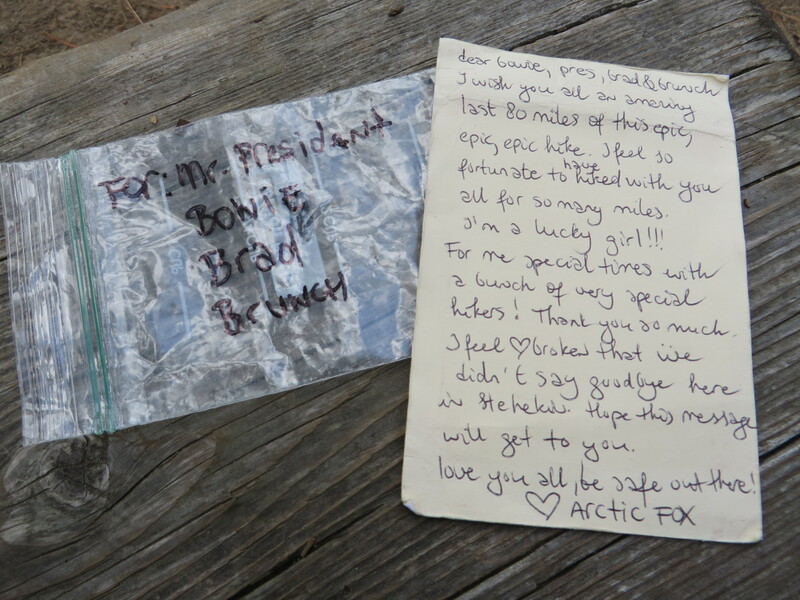 I decide to write my friends a note which I leave it for them to find at Bridge Creek, sealed in a ziplock bag, with a stone on top. Across the bridge, on the other side, I suddenly see an older guy waving at me. Out of politeness, I wave back to this stranger. When I cross the bridge, I finally recognize this hiker. It’s Meander! The Dutch trail angel who helped me getting on the trail back in June! What is he doing here! I’m super stoked to see him and we hug each other. The first thing he says to me is that he has a message for me, from Dutchess. 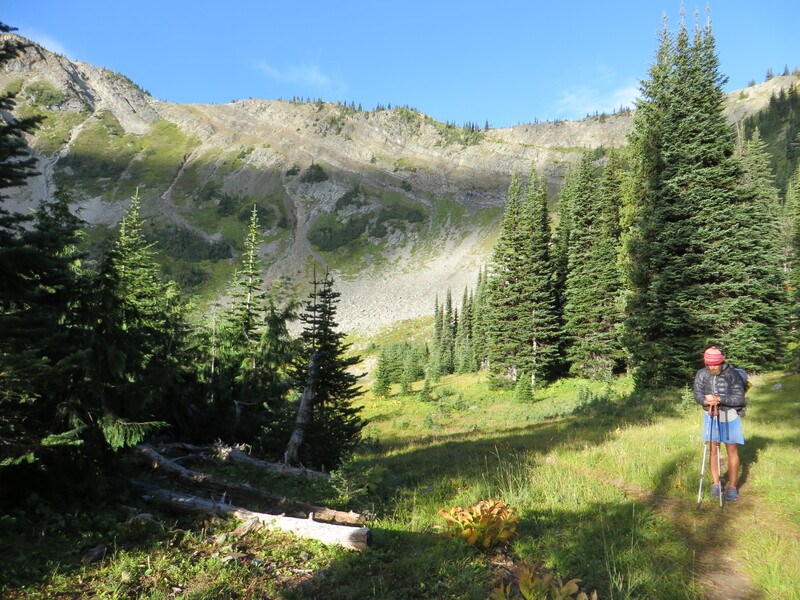 Because there is no cell reception in this remote area, he drove all the way from Bellingham WA, his hometown, to Rainy Pass (trail head for the PCT), a 118 mile road trip, and then hiked another 10 miles to find me and deliver the message to me. He knew I had to be somewhere around Stehekin, since the last message I posted on Facebook was from Skykomish, where I stayed at the Dinsmore’s. The message from Dutchess is clear. He is trying to catch up with us because he wants to finish at the Canadian border, all together. He reached Meander through Facebook, and asked him to tell us to slow down and wait for him. 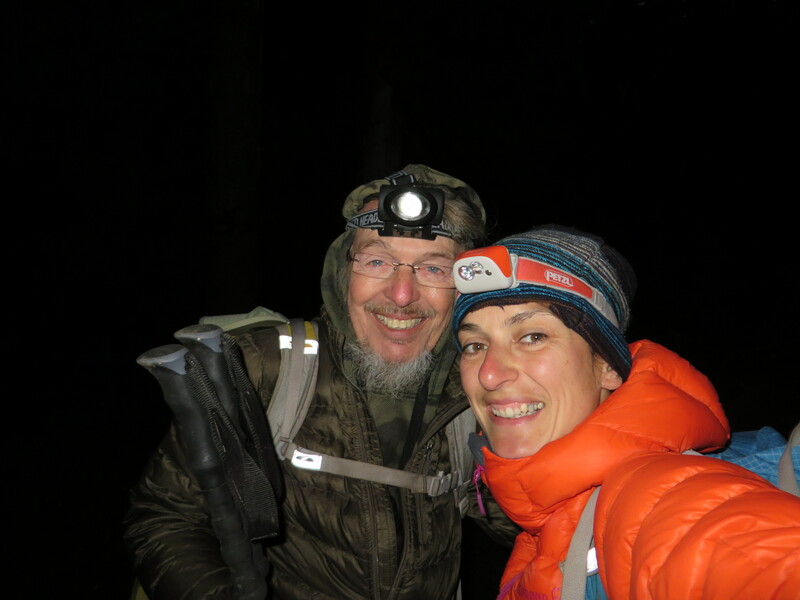 This wonderful trail angel, so generous and with a big heart for the hiker community he literally went all the way to deliver the message to me. Thank you so much Meander! 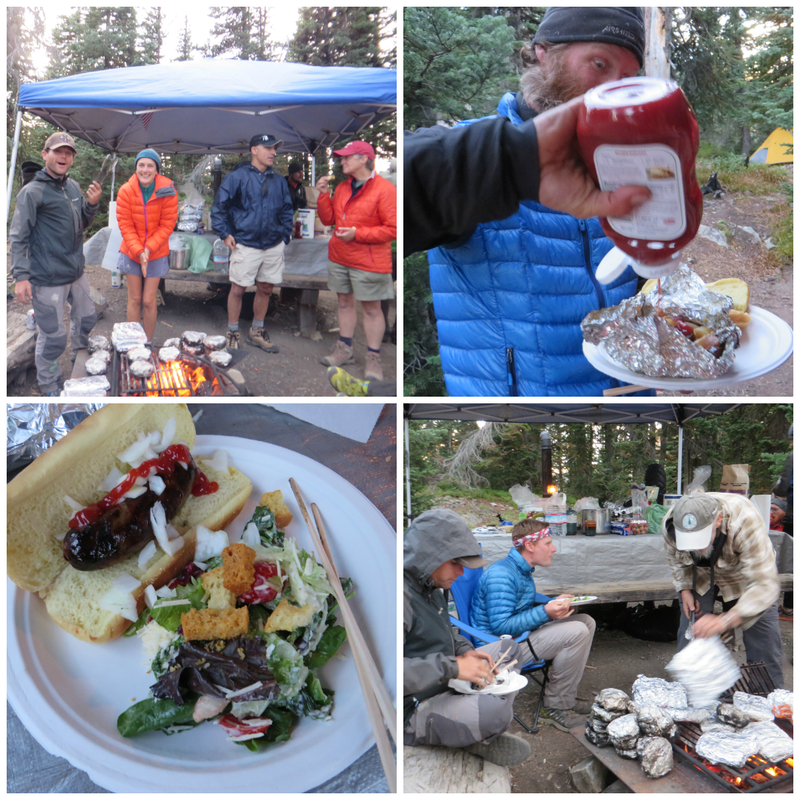 That night we camp near Bridge Creek. We talk and talk, we have a lot of catching up to do. 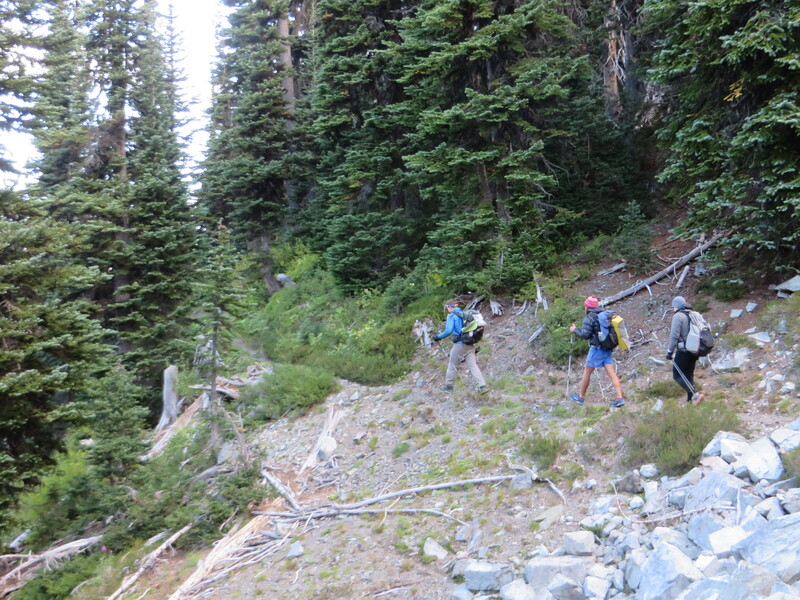 My mind is made up: I’m gonna hike back to Stehekin the next morning. I just want to be reunited with my friends again. 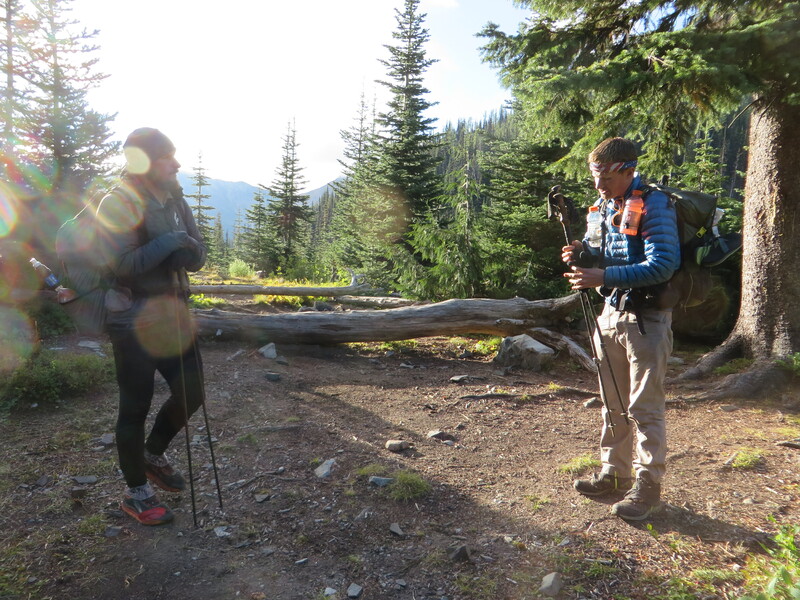 At dawn, I leave for Stehekin and Meander hikes back to Rainy Pass. But there is always time to take a selfie! I back track to Stehekin. Since last year, but definitely on this trip, I learned to trust my intuition more and more, and follow it. The mind maybe wants other things, like making a lot of miles everyday, so I can arrive in the High Sierras earlier, but my heart tells otherwise. And whenever I follow my intuition, I’m on rocket fuel! I’m on time for the 9 o’ clock bus. It’s funny to hike fast through the forest to catch a bus! In town, I find my friends, who are having breakfast at the Valley Ranch. They are super stoked to see me again and I am too! We hug and laugh and catch up. I’m so happy to see them again. That day, we just relax around the ranch. Chillin’ in the hammock and feeding the horses, drinking beers and having the best food. Brunch and Brad enjoying a zero in the garden. 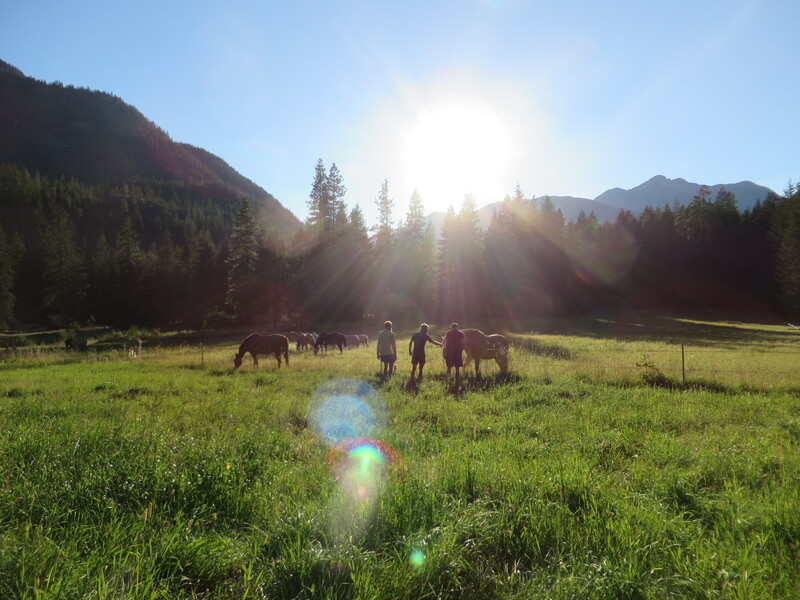 The boys feeding the horses during sunset. The next morning, I have a hunch that Dutchess is on the morning bus. And he is! Everyone is super happy to be reunited again! Dutchess has been hiking a few 40+ days in a row to catch up with us. 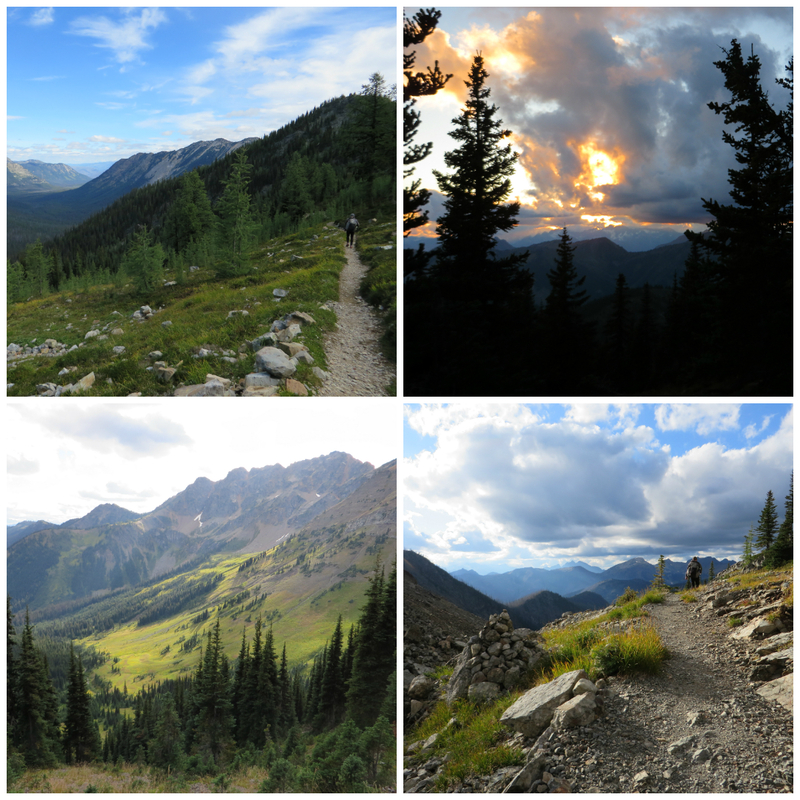 Through the roughest terrain, with lots of elevation gain and loss. And he did all that just to be with us! That day, we hike out together for our last stretch to the Canadian border. We take our time and enjoy the best Washington has to offer. When we arrive at Hart’s Pass, everybody is there. Meander, our friends, more hikers. And there’s food. A lot of food. A fire. Drinks. Even margarita’s! This is awesome. What a feast. In the middle of nowhere. That night, we eat, laugh, talk and have fun. These are the best trail days ever. Again, thank you so much Meander for all your effort! In the morning, we gather around ‘het kacheltje’, the heater Meander brought from Spain. There is breakfast: hot pastries and coffee! We hike out, and Meander waves us goodbye. From left to right: Brad, Mr. Prez, Brunch, Meander, Dutchess and Bowie. Goodmorning all! The last 30 miles to the border are hard but the views are stunning. And then, on a sunny Tuesday morning, we are there. 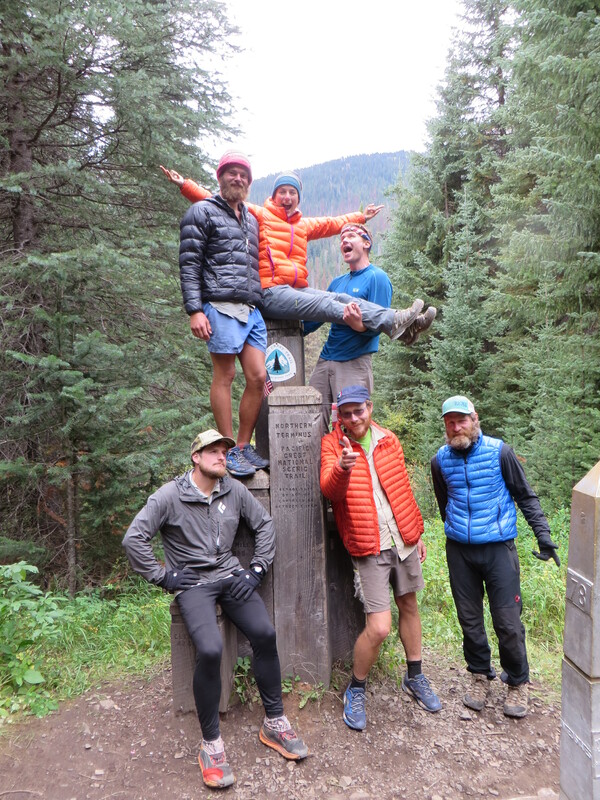 The guys hiked 2660 miles to get here. I hiked 1505 miles from Donner Pass to get here. But we are all here. Together. 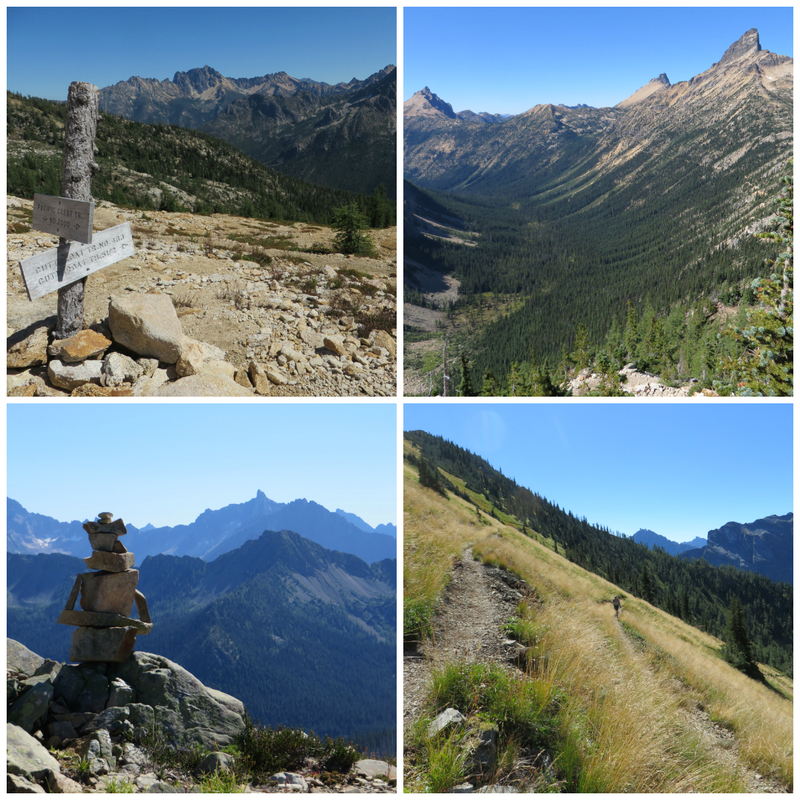 At the northern terminus of the Pacific Crest Trail. Such an accomplishment. It’s surreal to be here. I’ve seen so many pictures of this place. I’ve imagined arriving here. Now it’s that moment. I feel happy, relieved and so grateful to share this moment together with the guys. What an awesome trip this has been so far. The morning before hiking the last 6 miles to the border. Dutchess and Mr. President. Bowie, deep in thought before heading out to the monument on the last day. We did it! From left to right: Dutchess, Bowie, yours truly, Mr. Prez, Brunch and Brad. Happy! Dank je wel lieverd. Fijn dat je me volgt. Kus! Hi Vi, How are you holding up? Is het nog vol te houden daar? Ben even aan het inhalen op je blog, fijn al die updates from a different world!